First, I'm sorry for abandoning this blog. (again....) So many people rage, or write, or express themselves in some fashion when they're hurt or angry. I find that when the world gets nasty, I shut down. It's not particularly helpful, but it is what happens. The heightened publicity of trans murders and suicides just hurts me so deeply. Not so say that it DOESN'T hurt others, I have no doubt that it does. I just don't know what to do with that, I suppose. Anyway, that's not what I'm here to talk about today. There's a project I've been part of since May. Spokane TALL. 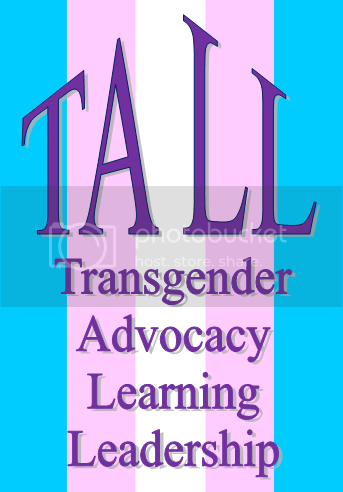 Tall stands for Transgender Advocacy, Learning and Leadership. In my view, it's a much needed project locally. For the last year we've been working slowly on by-laws, organization and getting our ducks in a row. Thinking about "who are we" and making sure we have our feet firmly under us. The project is made up (so far) of people who are very involved in other things, so progress is slow, but that's been ok.
We burst on the scene this Transgender Day of Visibility. We ended up with three events during the week! Monday we received a proclamation from the Mayor, proclaiming Spokane's first TDOV. Then Tuesday we showed Kumu Hina followed by a panel discussion. We had sixty four people in attendance!! I can't tell you how big that is. Just believe me, it is. Events are rarely that large in this city. Saturday we wrapped things up with a transgender health care forum, presented by Danni of Gender Justice League. I wasn't sure what the turn out would be, but I hoped it would be positive and that there would be a large enough crowd to make it worth Danni's trip over from Seattle (a six hour drive!) I set a goal for 20 people, and would have been blown away and so excited with 30 people. Twenty showed up which was fantastic. We've got more coming up too. This project is just getting started, and I'm so excited!